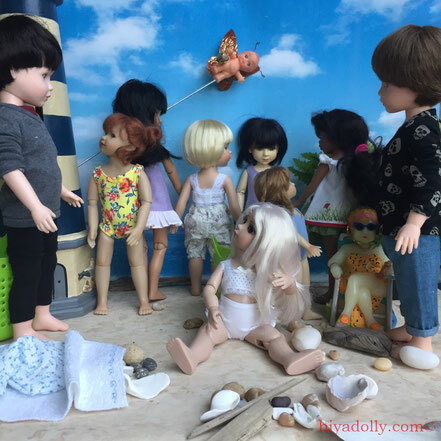 The Children at the Beach! 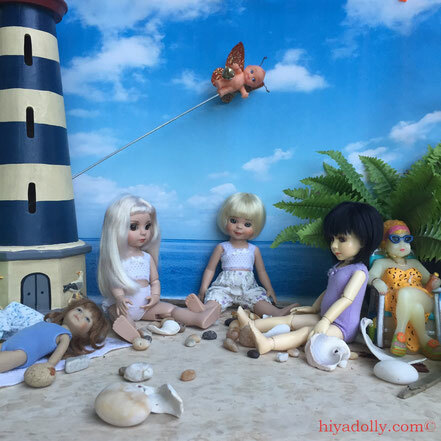 Phoebe and Oiya arrive at the beach in their bathing suits. Lucky girls! 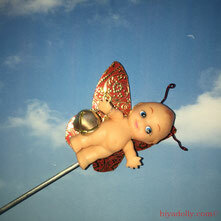 Oh yes, I'm sure Cupid Fairy is up to the task. The boys, Chris and Douglas, arrive and the little girls pack up ready to go home. 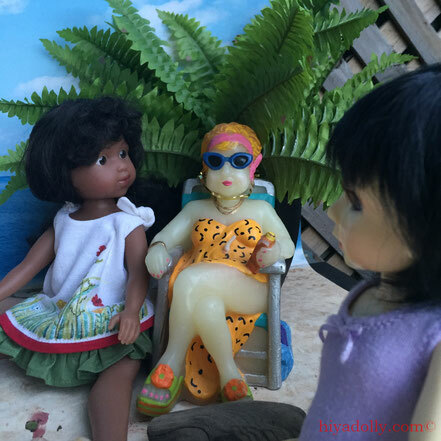 Shasta and Whoopi hang around to gather shells, stones and driftwood to take home. Crafts! "Can you guys bring the buckets? ", they ask. Heartstrings Beach Party Eva, our Phoebe, arrived in this little bathing suit outfit. We'd love to have swim trunks for the boys! I frequently check out your pictures. 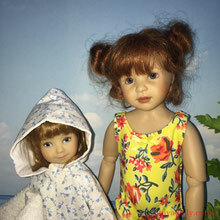 There's a freshness and subtle humour toa lot of your scenes, like the old beach lady who sits placidly among the much larger, much younger, doll children. Not only does the contrast in scale somehow work its own humor but that same contrast illustrates how elderly people feel around youngsters: the energy, fast motions, and noise of children often makes them feel larger than life. (Trust me, I know, I'm 76. I don't even like to SAY the number! Keep up the splendid work. I love your comment on relative scale! 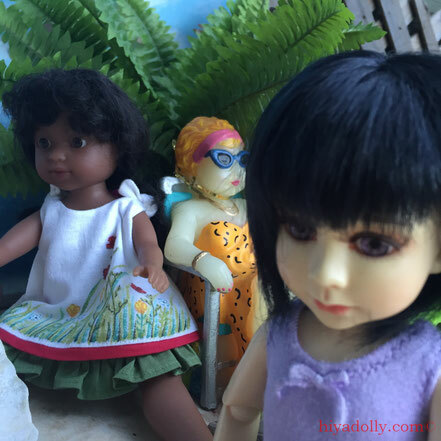 Dolltown deals with scale discrepancies all the time. We don't let them deter us from our story telling. 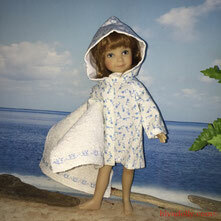 Our Beach Lady seems to be in a world of her own..maybe a bubble of protection from that child energy! Pop by again! I'll tell the children to quiet down when you are here. No guarantees. 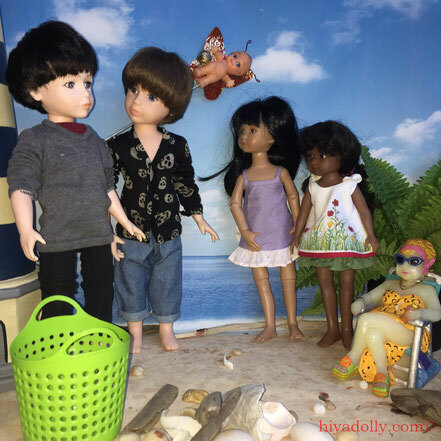 Oh my, it's getting crowded at the beach!!! 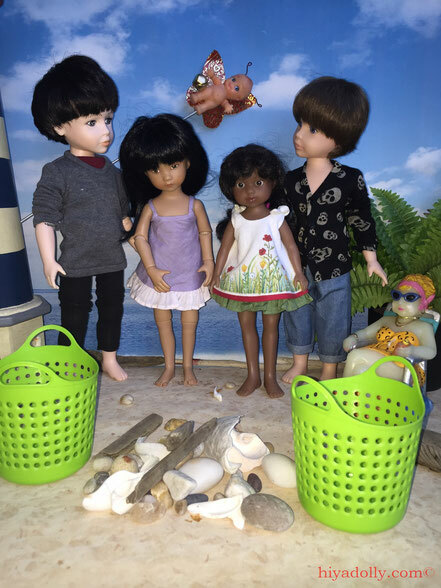 More friends, more curious characters, more adorable beach clothes. 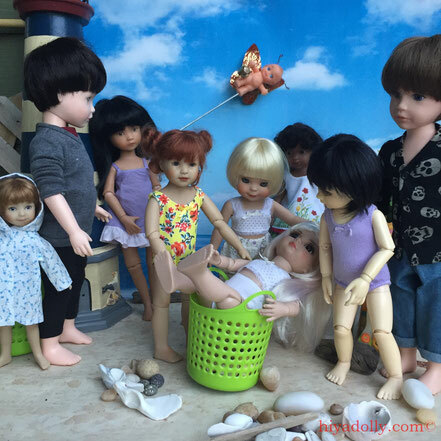 Well girls, I'm not sure cupid fairy will function any better as a lifeguard, but maybe he'll wave his magic wand and keep you from getting too close to the water!!! Hahaha, well Cupid Fairy was thrilled. 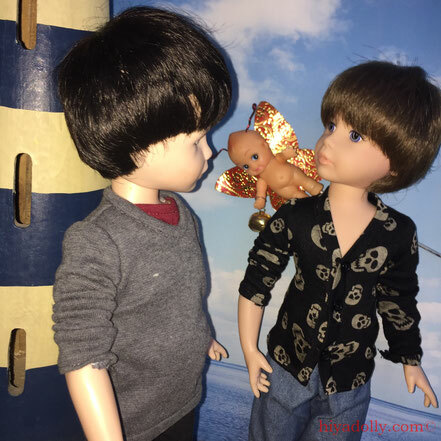 It's his first assignment in Dolltown. And who knew he would land such a serious job. Afterwards, we learned that his plan was to wake Beach Lady if there was a problem. So it's back to lifeguard job postings. Lucky it's the fall.